The bali mynah is a striking mynah. It is all white except for black wing tips and tail ends, a gold bill and a triangular light blue patch extending from the bill enclosing, and past the eye. The feathers at the top of the bill are ruffled, and from the back of the head thin, white streamers cascade down to the middle of the back. Weight can be up to 180 grams. 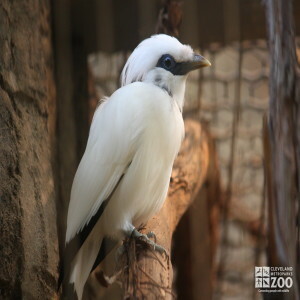 The range of the bali mynah is Bali and Lesser Sunda Islands. Bali Mynahs inhabit a restricted area on the island of Bali. 2 to 5 eggs. Several clutches a year are possible. The bali mynah is not often seen. It tends to be somewhat antagonistic and belligerent, especially during the breeding season. This particular species of mynah does not seem to be a bird call mimic, like other mynahs. Not much is known about breeding practices of the bali mynah in the wild. Zoo breeding, however, requires segregation of the breeding pair to prevent undue pressure on egg-laying and brood raising.